For those interested in deepening their spiritual understanding and physical health, the following are powerful resources suggested by Jason. Each link will take you to a new world, and perhaps the beginning of a new life, from the perspective of the mind, body and Soul. These spiritual masters and healers do not require cultivating new religious beliefs or joining any group. They are here only to aid those who are ready for an inner investigation, one that points to the heart. Neeta Singhal is a long time meditation practitioner and Vedic astrologer who has developed a profound healing science she calls RRST or Rudraksha Ratna Science Therapy. To learn more check out the link to her site below. Mother Meera and Braco do their work in total silence and aid in healing physical and mental karma. Sri Mooji gives public talks all around the world pointing people back to their innermost Self. The living heart. Gangaji is in the same lineage as Mooji, both having the same teacher Papaji, a saint from India. Gangaji also holds public meetings all around the world helping bring thousands back to the living heart. Susan Bame is a local healer who has some amazing technology for the healing process. The links below should not be considered a substitute for proper medical treatment or mental healthcare. Neeta Singhal has helped tens of thousands of people from around the world using her scientific approach called Rudraksha Ratna Science Therapy. Rudrakshas are sacred seeds with scientifically proven heeling benefits and gemstones are referred to as Ratna. After attaining specific information she assesses the chakra/nervous system imbalances one may be having. Many of the challenges we face on a daily basis come from the powerful influences planets can put on our bodies via their cosmic forces. When one's chakras become imbalanced, the nervous system can short-circuit causing anything from health issues, mental and physical to relationship and money problems. After reviewing your details and objectives, she gives a custom recommendation of gemstones and Rudrakshas which helps to balance the chakras bringing new levels of peace, harmony and health to the client. We at Radiant Family highly recommend this therapy as a powerful adjunct to your current treatment plan here at the clinic. Below is a link to a video with more information about her work. Here is the link to her online consultation and assessment of chakras. Sri Mooji is a living spiritual master of inner investigation and true life. He lives in Portugal and gives Satsang (association with Truth) to hundreds of thousands worldwide. His presence is pure grace and very transformational. Gangaji is a devoted spiritual teacher currently living in Ashland Oregon. After awakening to the timeless essence of her own true nature, she began teaching the sacred path of inner investigation worldwide. Gangaji's transmission of peace and joy is a gift to humanity...simply pure love. Below is her website and video biography. 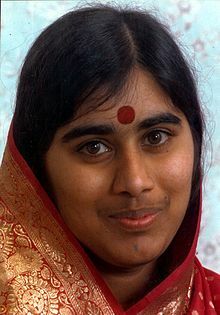 Mother Meera is one who imparts Grace and blessing through her eyes to the participant. Her Blessing is aimed at helping one overcome and remove karmic blocks in one's life. Her Darshan or spiritual blessing is one of the most powerful in the world and life changing. Braco is a world-famous healer who heals through his compassionate gaze alone. He never speaks publicly, but simply stands before thousands each day imparting his gift of healing. The link below is to his free online gazing site. He has sessions every few months, and always imparts love and compassion through his eyes. Susan Bame, founder of Bio Frequencies Clinic here in Grants Pass, is offering a unique opportunity to actually look into and analyze your own voice and its harmonics. The human voice holds all the harmonic information about the body and its state of health. After analyzing the harmonic code of one's voice Susan finds the most disturbed points of reference in the recorded voice print. She then locates the exact areas in the body which correspond to those points of disturbance in the voice and generates resolution or counter-tones. Listening to these tones aids in gently restoring harmony to all the points of disturbance in the body. I would highly recommend this therapeutic process to anyone wishing to resolve body or mind issues. I consider her work a perfect stand-alone therapy or as an adjunct to one's acupuncture, massage or Reiki treatment program. From my own experience, her frequency work goes far beyond physical healing into the restoration of human consciousness, re-calibrating one's deep inner connection to spirit, while stabilizing the mind and emotional state of the participant. Here are several links to learn more about this amazing work!